John Wesley was a man who filled the life that God gave him. On horseback, he covered every square mile of England; his words reached large congregations and filled numerous volumes of books. Even his own life is an example, as it spanned nearly the whole of the 18th century. Without question, this man knew and lived “the fullness of him who fills everything in every way” (Ephesians 1:23 NIV). Wesley began journaling at age 32 and continued through most of his life. Besides revealing the sheer volume of his activity, this autobiography tells of the faithful persistence of a man dedicated to spreading God’s Word. In its pages we also find the story of how Methodism formed and grew under Wesley’s diligent leadership. And by joining him on his long treks across England, we learn about the times and daily life of the English working class to whom Wesley so faithfully preached. 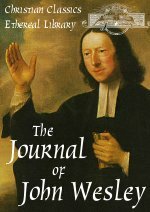 Every Christian should read at least one great missionary autobiography, and Wesley’s Journal certainly qualifies. The narration is by Gerard VanHalsema, a professional theatre student at Calvin College in Grand Rapids, Michigan. The cellist is Peter Plantinga and the audio technician is Emily Hanna.